It is like George Orwell’s 1984 has come true. Across the Country hate groups have been working to either manipulate or destroy our history and heritage. One side is attempting to use our historical symbols and monuments for political reasons and the other is trying to tear them down. The Virginia Constitutional Conservatives is fighting to not only preserve our history and heritage, but also the 1st Amendment Right to free speech; while also condemning those who wish to pervert our heritage into hate. Governor Elect Northam is working overtime to pressure state legislators to amend Virginia State Code, to allow his radical socialist pals to tear down historical markers and toss them in the trash. We are working with state legislators to not only uphold state code, but to actually strengthen the law protecting our history for generations to come. Please sign and then forward this petition to your friends and family so together we can take a stand against both violent extremes. THEREFORE, BE IT RESOLVED, We, the undersigned citizens of the great State of Virginia demand that our historical markers, symbols and monuments be preserved and protected from destruction and or removal. 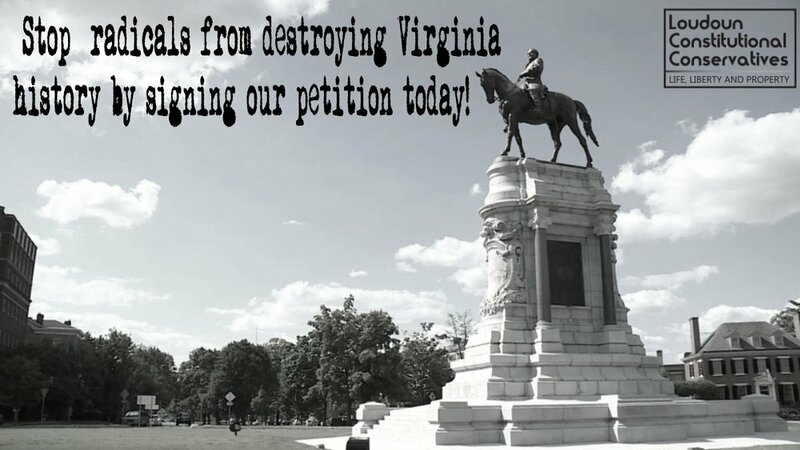 Be it further resolved, We, the undersigned citizens of the great state of Virginia condemn the actions of those that wish to pervert our history and use it as a symbol of hate and oppression. Be it further resolved, We, the undersigned citizens of the great State of Virginia demand the people remain free to exercise their right to free speech under the 1st Amendment to the United States Constitution. Be it further resolved, We, the undersigned citizens of the great state of Virginia demand that the violence and hatred from groups such as the KKK, Neo Nazis, White supremacists, Antifa and Black Lives Matter be condemned as detrimental to a free and moral people. Thank you for filling out the survey on preserving our monuments in Virginia!